Successfully Added Bluetooth Headset + Boom MIC with Recording and Playback Function to your Shopping Cart. Introducing the latest Bluetooth headset that records incoming & outgoing calls at a push of a button! This Bluetooth headset also comes with a boom MIC for super audio clarity, it can also be adjusted to suit either left or right ear use. This Bluetooth headset is compatible with all Bluetooth mobile phones and other Bluetooth devices. It is so easy to use, which makes it perfect for on-the-go busy workaholics, gamers, Hollywood agents as well as for people who just want to seem busy, when they are actually not. The boom MIC has a 225-degree swing so it can be adjusted to match how you wear this Bluetooth wireless headset. Whether you're wearing this headset at the office or in your living room, this headset will always deliver the comfort and performance you need. This Bluetooth headset is in stock now. Click "Add to Cart" and Chinavasion will express ship you a sample straight away. Once you see how great it really is for yourself then you can order in bulk for big discounts. 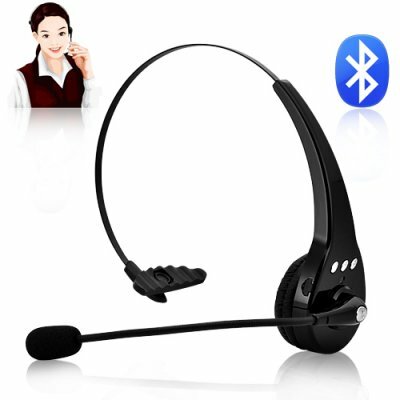 Main Function: Bluetooth headset for use with mobile phones, computers, PDA's, Bluetooth enabled communication devices, also comes with recording and playback feature. How strong is the microphone? The microphone will not pick up your voice if you speak softly. It works well in a noisy environment where you can speak loudly.